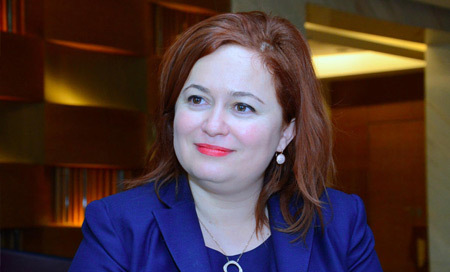 The Southern Gas Corridor project plays a key role in promoting the implementation of the Interconnector Greece-Bulgaria (IGB) project, Teodora Georgieva, executive officer at ICGB AD joint venture company, said in an exclusive interview with Trend. She pointed out that these two projects are interrelated, adding that IGB is a key project for diversification of sources and routes for Bulgaria. 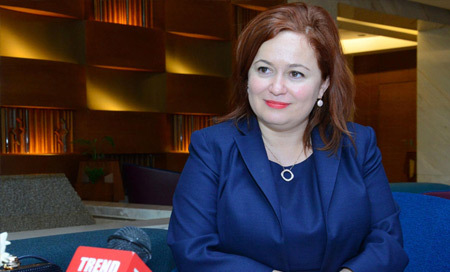 “We are very much relying on our partnership between Bulgaria and Azerbaijan. The backbone of this partnership is the contract signed between Bulgaria’s Bulgargaz and Azerbaijan’s state oil company SOCAR for supply of 1 billion cubic meters of natural gas per year from Shah Deniz 2,” added Georgieva. Talking about IGB, she said that it is a very mature, trans-boundary project: 31 kilometers of this pipeline will run through Greece and 151 kilometers will pass through Bulgaria’s territory. This project has two shareholders: Bulgarian Energy Holding EAD (50 percent) and IGI Poseidon S.A. (50 percent), she added. Georgieva pointed out that the advantage of this project is that it is supported by both Bulgarian and Greek governments, which is not always a usual case for interconnectors. Currently, Engineering Procurement and Construction (EPC) package is under development as part of the implementation of the IGB project, she said, adding that it is also planned to start the procedures for EPC this year. “In order to fit to what Azerbaijan promised to start the delivery of gas in 2020, we should definitely start the construction in 2018 so as to be ready,” said the executive officer. The main difference of the IGB project is that its commercial viability is also required to be verified, according to Georgieva. The executive director noted that the results of the market test, which was finalized in November 2016 for allocation of IGB capacity, were quite satisfying. Regarding SOCAR’s participation in the market test, Georgieva pointed out that this shows its interest in this project. “SOCAR also booked capacity in IGB, which shows its trust in the project and proves that IGB is recognized as a project playing a key role for the implementation of the Southern Gas Corridor project,” she added. “We already have 1.570 billion cubic meters of the IGB capacity booked for the long term, which is very satisfactory,” she added. The IGB project already has external shippers different from the shareholders and this really shows that there is interest in the project and in the Southern Gas Corridor in general, said Georgieva. It shows that IGB is not only a project connecting two countries, but rather a project which will have a regional impact, according to the executive officer. “The pipeline’s capacity can be increased to 5 billion cubic meters per year with the construction of additional compressor stations. If the interest is more, we are ready to reconsider the capacity,” said Georgieva. She pointed out that IGB can help to deliver gas to the countries which could suffer from gas shortage in the future and from this point of view, it has a substantial role. IGB is a gas pipeline, which will allow Bulgaria to receive Azerbaijani gas, in particular, the gas produced from Azerbaijan's Shah Deniz 2 gas and condensate field. IGB is expected to be connected to the Trans Adriatic pipeline via which gas from the Shah Deniz field will be delivered to the European markets.